Sun & Moon 1 (Winter 1976). Sun & Moon magazine ran from 1976 to 1986, publishing eighteen issues, and Sun & Moon Press began in College Park, Maryland, in 1978 with the publication of poet Charles Bernstein’s Shade, with a cover by Susan B. Laufer. The press and magazine soon moved to Los Angeles. It is almost impossible to overestimate the importance of Sun & Moon to the community of experimentally minded writers in the United States, West or East Coast. A vibrant and flourishing publishing concern, continuing in the footsteps of New Directions, Sun & Moon effectively established a new avant-garde tradition for the end of the twentieth century and the beginning of the twenty-first. The press and the magazine mixed cultures past and present. The books were beautifully and carefully produced and printed in runs of 1,000 to 2,000 copies, which, according to proprietor Messerli, kept the unit costs down. Among the many avant-garde and experimental writers Sun & Moon has published are Henry James, André Breton, Gertrude Stein, Djuna Barnes, Jackson Mac Low, Barrett Watten, Lyn Hejinian, and Charles Bernstein in the Classics series, Lewis Warsh, Johnny Stanton, Curtis White, and Paul Auster in the New American Fiction series, and Rae Armantrout, Clark Coolidge, and Dennis Phillips in the New American Poetry series. Charles Bernstein, Shade (1978). Sun & Moon Contemporary Literature Series no. 1. Cover by Susan B. Laufer. 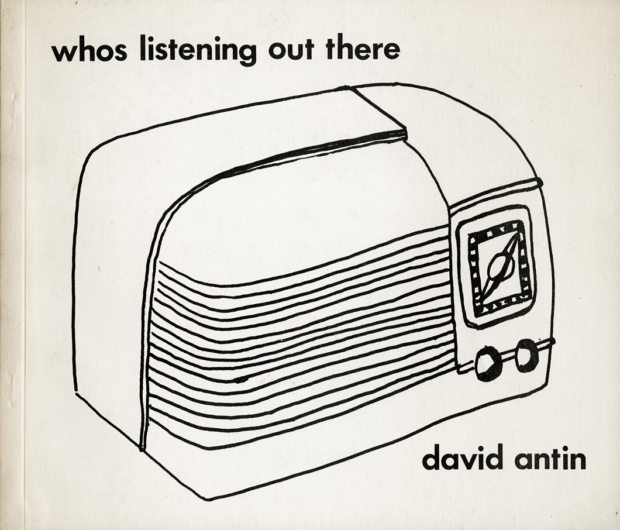 David Antin, whos listening out there (1979). Sun & Moon Contemporary Literature Series no. 4. Cover by the author. Ahern, Tom. Hecatombs of Lake. 1984. Sun & Moon Contemporary Literature Series, no. 21. Antin, David. whos listening out there. 1979. Sun & Moon Contemporary Literature Series, no. 4. Bernstein, Charles. Content’s Dream: Essays 1975–1984. 1986. Bernstein, Charles. Shade. 1978. Cover by Susan B. Laufer. Sun & Moon Contemporary Literature Series, no. 1. Brownstein, Michael. Oracle Night. 1982. Cover drawing by the author. Sun & Moon Contemporary Literature Series, no. 13. Cory, Jean-Jacques. Particulars. 1980. Sun & Moon Contemporary Literature Series, no. 8. Darragh, Tina. on the corner to off the corner. 1981. Sun & Moon Contemporary Literature Series, no. 10. DiPalma, Ray. Cuiva Sails. 1978. Sun & Moon Contemporary Literature Series, no. 2. Frank, Peter. The Travelogues (1971–1977). 1982. Sun & Moon Contemporary Literature Series, No. 12. Greenwald, Ted. Word of Mouth. 1986. Hejinian, Lyn. The Cold of Poetry. 1994. Herbert, F. John. The Collected Poems of Sir Winston Churchill. 1981. Sun & Moon Contemporary Literature Series, no. 9. Inman, P. Platin. 1979. Sun & Moon Contemporary Literature Series, no. 5. Mac Low, Jackson. From Pearl Harbor Day to FDR’s Birthday. 1982. Sun & Moon Contemporary Literature Series, no. 14. Messerli, Douglas. Dinner on the Lawn. 1979; revised edition 1982. Sun & Moon Contemporary Literature Series, no. 7. Messerli, Douglas, ed. Contemporary American Fiction. 1983. Sun & Moon Contemporary Literature Series, no. 18. Sherry, James. In Case. 1981. Sun & Moon Contemporary Literature Series, no. 11. Stehman, John. Space Dictation. 1978. Sun & Moon Contemporary Literature Series, no. 3. Vance, Ronald. I Went to Italy and Ate Chocolate. 1979. Sun & Moon Contemporary Literature Series, no. 6. Warsh, Lewis. A Free Man. 1991. Warsh, Lewis. Methods of Birth Control. 1983. Sun & Moon Contemporary Literature Series, no. 16. Weinstein, Jeff. Life in San Diego. 1983. Cover and artwork by Ira Joel Haber. Sun & Moon Contemporary Literature Series, no. 17. Wine, James. Longwalks. 1982. Sun & Moon Contemporary Literature Series, no. 14.